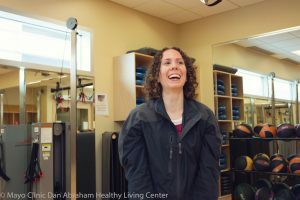 Laura Swenson, MS, RN, Patient Education Specialist for the Office of Patient Education, says that, "Laughter can be very contagious. Share it with everyone. It can be used for general health, chronic conditions, mental health, relationships, workplace stress, not to mention, it is safe for all ages. Common side effects: release physical tension, heart and vascular health, boosts immune system." Try Laughter Yoga —a fun combination of stretching, breathing and laughing exercises that can help you feel awakened, confident, creative, productive and rea dy to tackle anything. Have a joke jar at home or in your office.